affect the quality of signal to be received by the mobile systems. cell is less. This can be improved with increase in height. 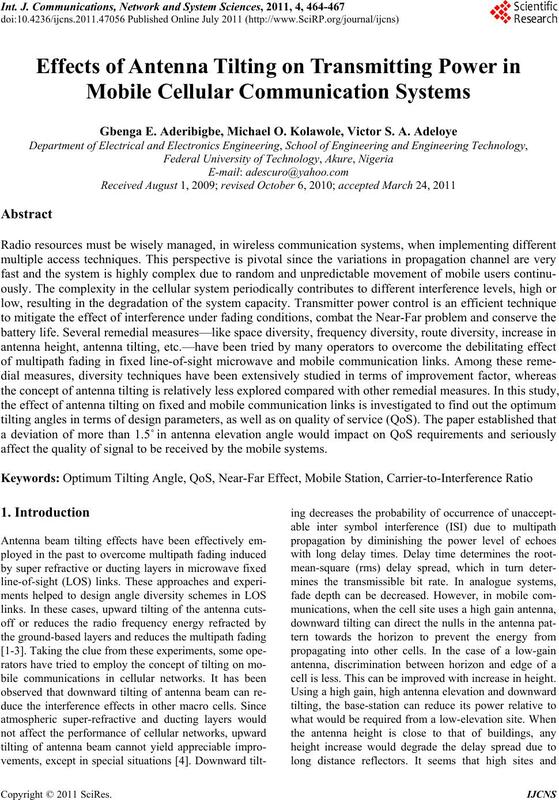 G. E. ADERIBIGBE ET AL. be reached in the upper floors of high-rising towers. 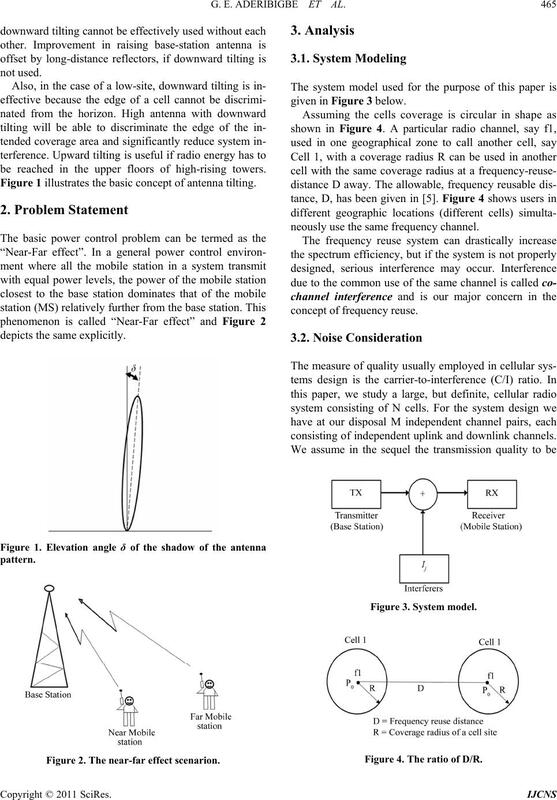 Figure 1 illustrates the basic concept of antenna tilting. Figure 2. The near-far effect scenarion. given in Figure 3 below. neously use the same frequency channel. consisting of independent uplink and downlink channels. Figure 4. The ratio of D/R. is the received power from interferer j.
size (cardinality) of this is denoted Q(m). channel cells of the set. cell i using this particular channel. Using this notation, we may derive the C/I at MS i. Figure 5. Link geometry link gain model. where μ = mean value of J.
σ = Standard deviation of J.
f = A point in the sample space. 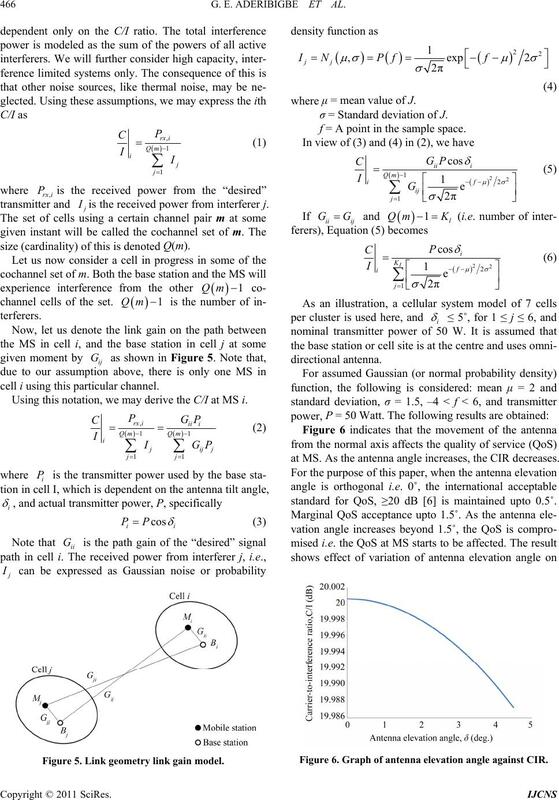 at MS. As the antenna angle increases, the CIR decreases. standard for QoS, ≥20 dB  is maintained upto 0.5˚. Figure 6. 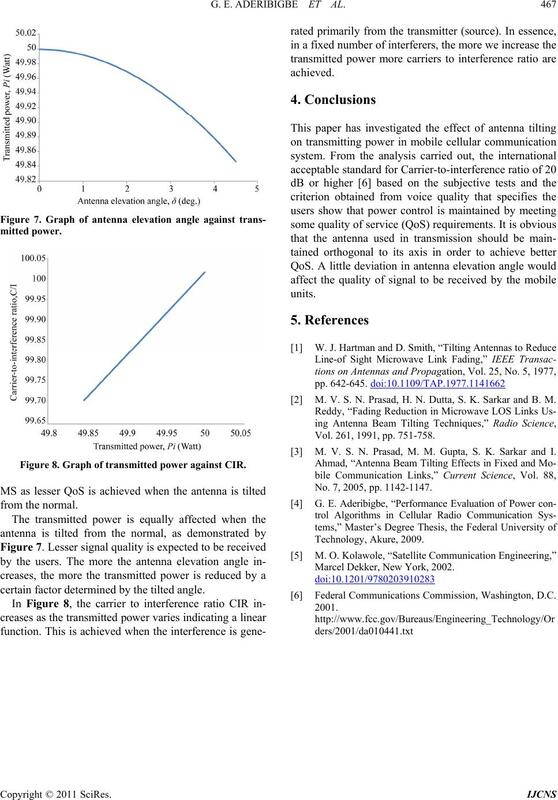 Graph of antenna elevation angle against CIR. Figure 8. Graph of transmitted power against CIR. certain factor determined by the tilted angle. M. V. S. N. Prasad, H. N. Dutta, S. K. Sarkar and B. M.
Vol. 261, 1991, pp. 751-758. M. V. S. N. Prasad, M. M. Gupta, S. K. Sarkar and I. No. 7, 2005, pp. 1142-1147. Marcel Dekker, New York, 2002.